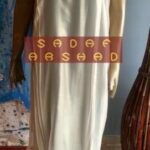 Sadaf Arshad excels in ready to wear designer dresses, bridal wear, party wear, casual wear dresses designing on orders and amalgamates Pakistani traditional cuts in and exceptional way. This stunning casual & formal wear collection 2013 by Sadaf has consists of long shirts, A-line shirts, frocks has embellished with little bit embroidery, tussles on shirt and loops on sleeves which make them elegant and stylish. If you are going to some dinner party than these are perfect dresses for you. All dresses are looking very nice and decent and comfortable too. As when we all choose a dress for ourselves than must keep this thing in mind that a dress should be comfortable as if you wear comfortable dress than you can look more pretty and relaxed. 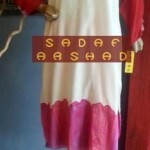 Latest Sadaf Dziner Studio winter collection for women 2013 is a perfect for casual, party and formal wear. Just have a look at this fabulous collection for winter 2013 by Sadaf here below..